We love all things convertible that bring multiple functions to one beautiful object. A great example: Argington’s Ayres Twin Bed, which is a pint-sized twin bed for your tots, with a second trundle that pulls out for sleepovers (or proof that there AREN’T monsters under the bed). Argington uses FSC woods and non-toxic finishes, all designed with sleek and simple kid-friendly aesthetics. The Ayres Twin Bed is part of the Wonders Collection, each piece coming with information about the natural treasure that inspired the furniture design. All of Argington’s furniture is designed to be reusable and adaptable, so that it grows as your children grow. As for materials, all of their pieces are manufactured with FSC certified timber and non-toxic finishes. Nice design but HORRIBLE customer service. We had to wait 12 weeks to receive this bed and when it finally arrived it was broker, I called Argington directly and the owner Andrew Argington was arrogant and wasn't willing to accommodate us in any way, He was willing to exchange but we had to wait 4 more weeks to get the exchange, What a joke!!! Save your money and order something else! We had exactly the same service as Julia. Great product but it arrived damaged and we waited at least 2 months for the replacement. Customer service would not answer our emails and they were rude when we talked to them directly. It really left a bad taste and we ended up selling the bed early because of the dissatisfaction with the customer service. We love all things convertible that bring multiple functions to one beautiful object. 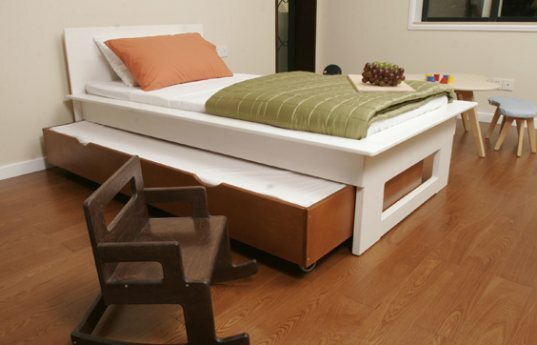 A great example: Argington's Ayres Twin Bed, which is a pint-sized twin bed for your tots, with a second trundle that pulls out for sleepovers (or proof that there AREN'T monsters under the bed). Argington uses FSC woods and non-toxic finishes, all designed with sleek and simple kid-friendly aesthetics.